Doesn't she look a little too excited for a Klout score of 38? 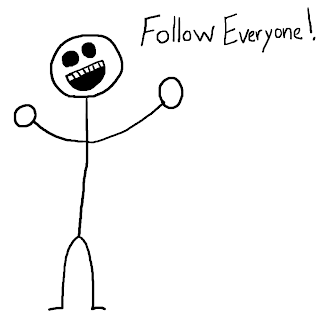 Chasing a high Klout score to become influential is somewhat akin to chasing materialism as a way to achieve happiness. Both are bound to end in disappointment. Or at least that’s what the Dalai Lama would say if he knew about Klout. 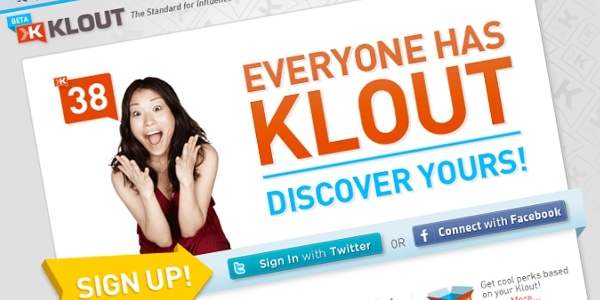 Klout’s formula of influence itself has continued to shift as the company grew. It started off by only measuring people’s influence on Twitter and soon expanded to include other online networks such as Facebook, LinkedIn, FourSquare and even blogging platforms. It seems that the change in algorithm now gives greater weight to Facebook than it did before. And as a result, most people on Twitter have found seen their Klout scores drop. If you think about it, it makes good business sense. A LOT more people are on Facebook than on Twitter. More numbers = more revenue for Klout. So far, most people registered with Klout have been Twitter users. Know anyone who is only on Facebook and knows/cares about Klout? It seems that this is exactly what Klout is looking to change by adding Facebook as a major variable in the influence game. The biggest lesson from the Klout debacle should be this: As Klout’s algorithms change, so will your score and your so-called 'influence.' Are you any less influential than you were yesterday even though your score has dropped? Of course not. That itself should speak volumes about the wisdom of focusing so narrowly on Klout as a barometer of influence. We can cry ourselves hoarse over the unfairness/foolishness of using Klout as a metric, but the truth is that as long as there are people who attach some degree of importance to Klout scores –companies giving out free products to influencers, recruiters, conference organizers looking for speakers with high Klout scores—there will be people paying attention to their scores and consciously looking to game/improve on them. What are your views on Klout? Love it, hate it, ignore it? Is Social Media For Everyone? By now, most people understand the ‘why’ of social media – why it’s important as a communication/marketing/PR and customer service tool to engage with your target audience and amplify your message. The ‘how’ is what a lot of people still grapple with and that’s where, most often, PR and social media consultants come into the picture. As much as we all champion social media, is it really for everyone and for every type of business? With all the blog posts and material online that wax eloquent on the benefits of social media for every type of business, there is no lack of proof that it works. But sometimes, we need to examine the question more than the answer and I don’t believe social media alone is the answer to everything. Recently, I had the opportunity to delve into this question a little more deeply after I met with a prospective client who runs a hair loss restoration clinic for women. This client had been grappling with the question of starting a Facebook page for a while and said she’d gone over her head reading books, listening to webinars and other tutorials on using Facebook and was still trying to figure out if it would work for her business. Hair loss being a very personal (and often traumatic) experience, especially for women, her clients preferred to keep their treatments private. In many cases, even the spouses of the women did not know that they were undergoing treatment. Since most current and prospective clients would not want to make their interest or association with her public, her question was if a Facebook page made sense for her business? I’m sure there are other similar businesses, especially in the health care sphere to whom this question applies as well. How do you then decide whether a Facebook page or social media in general, is for you? 1. Evaluate your goals and target audience: A lot of businesses make the mistake of focusing on the tools instead of the broader strategy. Before thinking about whether Facebook is right for you, it’s better to start at the beginning by evaluating your business goals and target audience more thoroughly. In the case of the hair restoration clinic, the client’s goal was mainly to focus on the local target audience, mainly women in the New York City and Long Island area, and to generate a few new clients every month. The strategy would be to reach out to these women in a way that they felt comfortable with and provide them with enough information to trust the client’s clinic for their treatments through a variety of integrated approaches - a combination of PR, marketing and social media. Once you have the goal and strategy mapped out, selecting the right tool will be easier. Before wading out into the social media world, evaluate the basics. - Does your website provide the information potential customers may be looking for? - Is it easy to navigate? - Does it include keyword-rich copy? - Does it have a clear call to action? - Does it have the relevant title tags and meta tags to help clients find you online when they search for you online, besides implementing othe off-page SEO techniques? When in doubt, ask. If you’re not sure if your audience would like to engage with you publicly on social media sites, the best thing to do would be to ask current clients. Every business has different goals and so while it doesn’t make sense to do blindly emulate your competitors, it does make sense to examine whether your competitors are using social media and what level of success they’re achieving, if any, and how you can do better than them. In the case of the hair restoration clinic, it would make more sense to start with a blog than a Facebook page since prospective customers could read and comment anonymously and still learn more about the clinic and the various treatments available. A blog would also give the client an opportunity to create keyword-rich and informative content that would help potential customers find the clinic when they search online. An e-newsletter may also make more sense since customers could sign up for it on the website and receive and read it privately over email. Since one of the major reasons businesses use social media is because of its ability to allow us to engage with other people, it is worthwhile to ask if it makes sense to invest in it if it is likely to yield limited engagement. Solo PR pro Kellye Crane wrote a great and somewhat related post recently ‘Does it Make Sense to Blog Even If No One is Reading’ that talked about the indirect benefits of blogging – letting your customers find you through your content, giving them an opportunity to learn about your expertise and driving traffic back to your website. Back to the original question, while a Facebook page may see limited engagement and interaction, it can still be used as an additional, if not the primary, channel to share blog posts, e-newsletters and other updates. The fact still remains that people spend a lot of time on Facebook (even more than they may admit) and are more likely to read your e-newsletter and blog post even if they may not open your emails. Do you think social media is for everyone? Does it makes sense to have a Facebook page if actual engagement is likely to be low? Share your thoughts! Welcome to Social Media Prism. This blog offers my personal views on social media and the rapidly-changing world of communication. Thanks for visiting and please feel free to join me in this conversation. You can read more about me and my blog here. Social Media Prism by Farida Harianawala is licensed under a Creative Commons Attribution 3.0 Unported License. Permissions beyond the scope of this license may be available by contacting the author. Theme images by mattjeacock. Powered by Blogger.